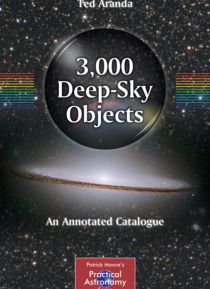 This title is a comprehensive set of visual descriptions of deep-sky objects visible from the northern hemisphere. It is a record of the most extensive and systematic visual survey of the sky ever done in modern times. 3,000 deep-sky objects are listed with short descriptions of the visual appearance in the author's powerful binocular telescope. Objects in the book are organized by position for ea… sy identification of unknown targets. Full indexes by catalog numbers and names allow searches for specific objects.